I like to start my reviews of Adobe CS4 software by referring to my previous reviews, in this case, Illustrator CS3. The new version has a number of new and enhanced components which I will describe. While still a program based on working with vectors, Illustrator CS4 has added the Blob brush which allows the user the semblance of painting. It expands the scope of Illustrator and is a lot of fun to use. I'll describe it later. The workspace has joined the uniformity of workspaces of other CS4 programs. The panels are dockable as well as undockable and you can tab files in the same manner as in other CS4 programs. You can, also, arrange multiple documents on the canvas by accessing the Arrange Documents button on the right on the top toolbar. Here is one of the configurations showing multiple documents. You can fit to actual size, zoom in and out of the individual images, etc. 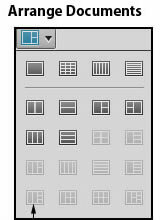 By using the Artboard tool, which I will discuss, you can click on one of the images and turn them all into artboards. 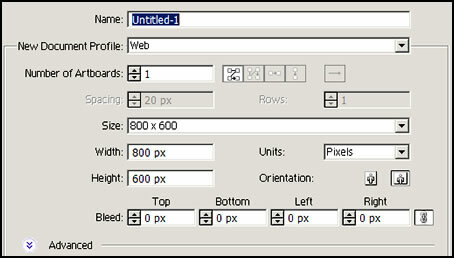 As I stated, the tabbed document feature is also available in Illustrator CS4. It has many practical purposes other than just being able to open multiple images. 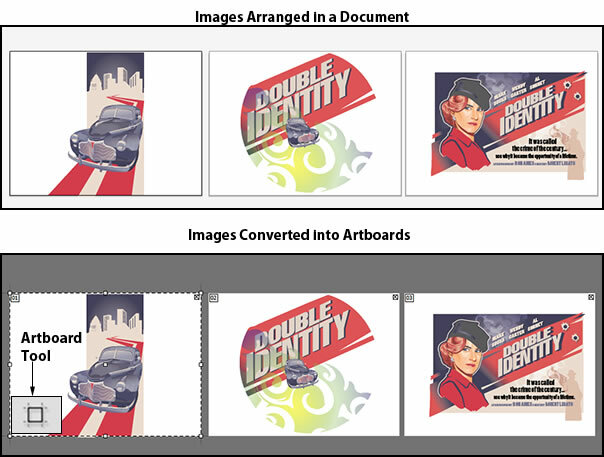 You can work from the tabbed document window and add these images as artboards in a single document. In the new multiple artboard feature, you can have 1-100 open at a time. Below are the Artboard tools. When you specify the setup of a document, you can, also, specify the number of artboards in the document. In other words, you can collect many images on one canvas as artboards to use in a document. You can change the images to artboards by accessing the Artboard tool. The new Artboard tool is what you use to work on an artboard. Notice the little number 01 in the top left corner of the artboards. This designates it as an artboard. This has opened up a new venue for ease of use and creativity. If, for example, I had three artboards in my document, I could save it as 3 pages where each artboard would be on a separate page - all in one document. Then I could preview each image on its own page; or I could show a client one file with many versions of his logo instead of many separate files. Quick alignment is now very easy to do. You just select the group of objects and click on the one you want to be the key object. Then, you click on the alignment icons on the toolbar. 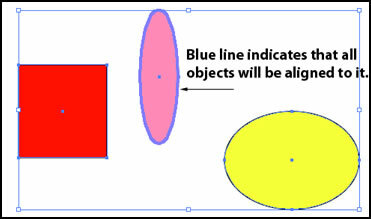 Both the images below and above are screen captures so that the working elements are visible such as the blue line around the key element. The Blob brush is a great new tool. Here is a free form figure created. 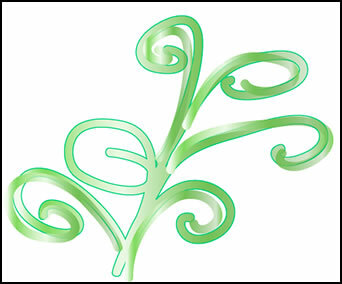 Notice how the Blob brush creates vectors even though it appears to work like a paint brush in Photoshop. When using the brush, like colors can merge together. 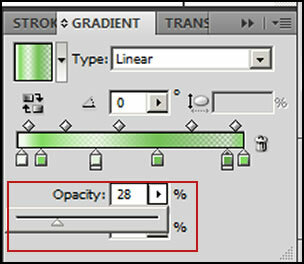 The ability to do more with gradients has been added to Illustrator CS4; for example, an opacity slider has been added to the Gradient panel so now you can specify the opacity of a gradient which, once again, increases the scope of Illustrator CS4. It was very easy to take the design created with the Blob brush and change it with the Gradient panel. These designs are meant to demonstrate a technique. They were created in less than a minute each. Adobe has added features to improve the core functionality of the program such as making the clipping mask clearer by being able to edit it without other objects interfering and enhancing the Appearance panel from CS3, just to name a few. If you look at the screen capture on the right, strokes and fills can be accessed from the Appearance panel. This panel also allows you to access Live Effects by clicking on the "fx" at the bottom of the panel. From the Appearance panel, I created a simple geometric design. I was able to do all my transforming, etc. from that panel. 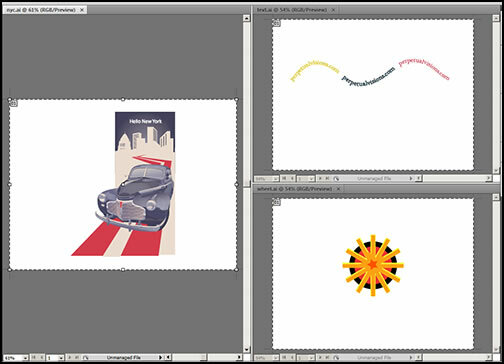 As in Photoshop CS4, in Illustrator CS4 a lot can be done by just accessing a few panels. The Graphic Styles panel has been updated for better previewing of how effects will look. You can now, also, preview them on text. In the simple design above, I wanted to preview how an effect would look. From the Graphic Styles panel, I clicked on Effects and chose 3D. Then, I right clicked on a style, and it showed how it would look if selected. This really saves time. The smoothness and ease of creating text on a path has been enhanced. The letters are spaced evenly. To the text I created I added some Type Effects from the Graphic Styles panel. 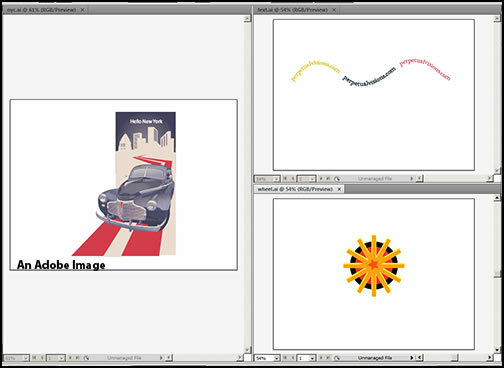 The ability to export has been enhanced in Illustrator CS4. You can save in the FXG format. You, can, also, export artboards to the following formats: PDF, PSD,SWF,JPEG,PNG, and TIFF. 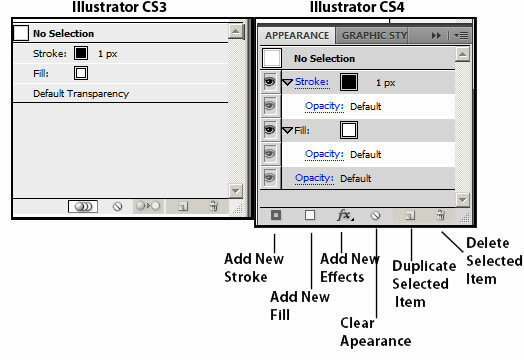 For more information on Illustrator CS4, click on the link which will take you to the Adobe website. There, you can also explore Adobe's other great products. 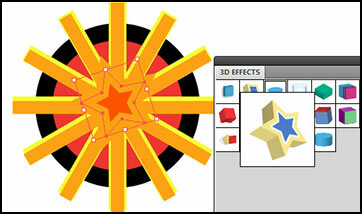 Also, click on the word "demo" which will take you to the trial version Of Illustrator CS4. For information on the Adobe Creative Suite 4 Master Collection, click on the link. The cost is US $2,499.00 with upgrades from US $899.00 You can get a trial DVD set for US $15.99. This link, also, lists all the programs contained in the Master Collection as well as give information on the individual programs. I found Illustrator CS4 to be the easiest and most creative of all the versions. There have been wonderful new enhancements and additions. All I tried worked flawlessly and made creating so much easier. I have not described all the areas. 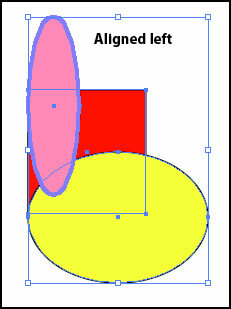 As I keep working with Illustrator CS4, I find more areas that have been improved or expanded. I particularly like the new Appearance panel for its ease of use. I, now, don't have to open as many multiple panels because I can do so much work from just that panel. I, also, particularly love the Blob brush because of its ability to perform in a "painter- like" mode and yet have each stroke be a vector. This is an excellent update. For those who mainly use Photoshop and only Illustrator on occasion, I believe this version will be the easiest to use and will increase your creative range.